sailboat. : Mirrored Accessories with an added LOL. I’ve been an admirer of mirrored furniture for such a long time and I would love to own a mirrored dressing table but only if it came with it’s own cleaner who could come to my house twice a day to keep it looking pretty and smudge free. Either that or no one would be allowed to touch it, ever, because I’m a long way from being a domestic goddess! A couple of days ago I was in pound stretcher looking at things I didn’t really want or need but they were tempting me because most things in that shop are blimmin’ bargains! 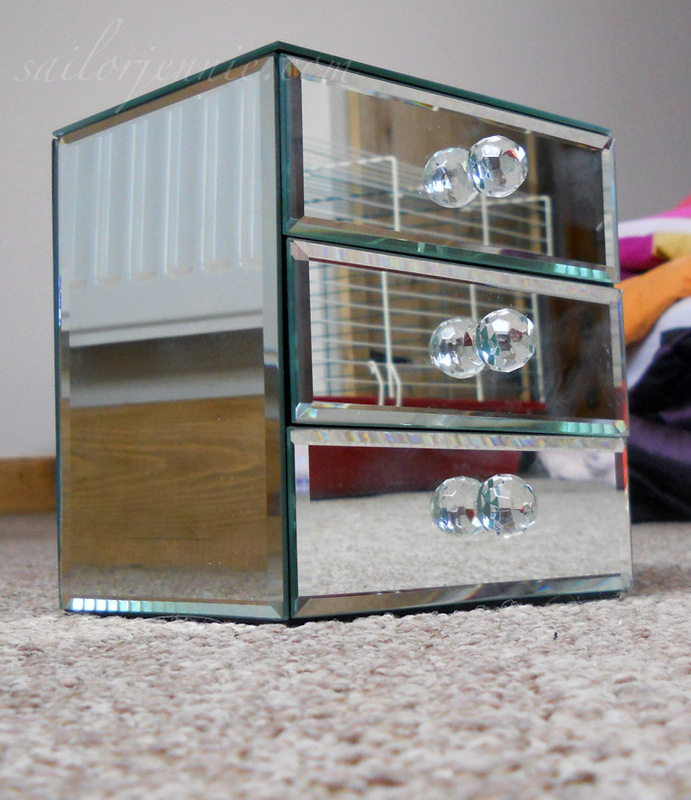 Anyway, I forgot about everything else when the magpie in me was drawn to this lovely little mirrored set of drawers. At £9.99 I’m not convinced I got a total bargain but I had to have it and I needed something pretty to put my jewellery in! It’s not quite big enough to store all of my jewellery (I’m thinking this might be an excuse to go and purchase another one) but I’ve managed to fit in my most worn items, which is fine for now. The top drawer has my watch, charm bracelet and my favourite dream catcher necklace in it as well as a few extra items that wouldn’t fit anywhere else. None of the drawers are particularly organised which is typical Jennie! 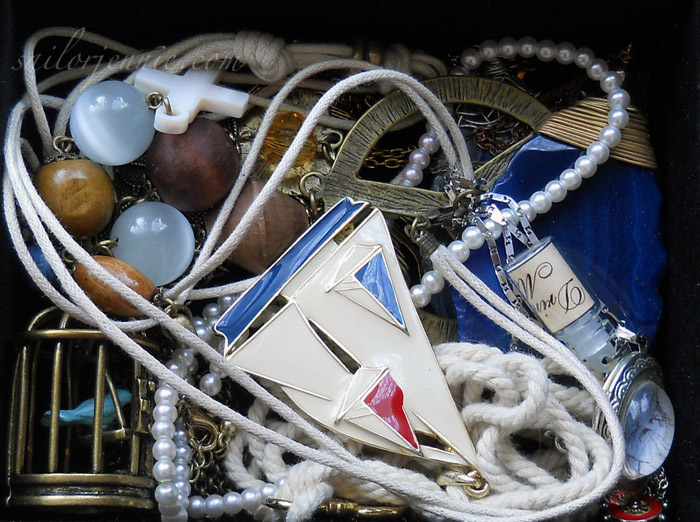 The middle drawer is practically over flowing with a whole array of different necklaces. See, I’m definitely thinking I need to go back and purchase another set of drawers! The bottom drawer has a couple of my favourite rings and a lot of earrings! For someone who once said she wasn’t that into earrings I certainly have a lot and even though my hair usually covers them, I just love to wear a different pair every day! Maybe I should get a designated earring holder? I bet there are some pretty ones out there! I find jewellery super difficult to store so I'd love to know how you lovelies store your jewellery!? 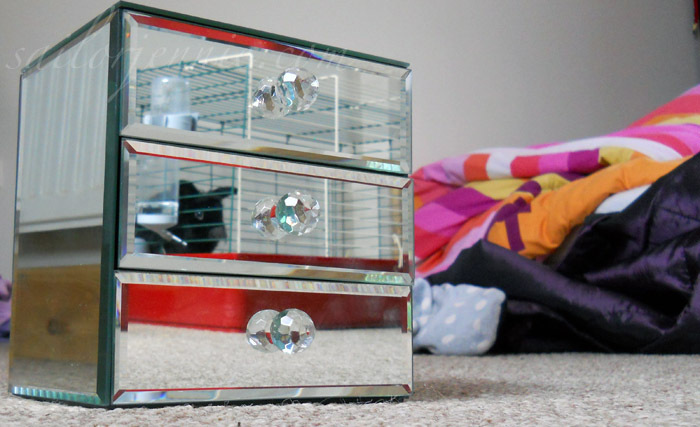 Do you love mirrored furniture and accessories too? P.S. If you can look past the absolute state of my room you’ll see why I couldn’t not include this picture! Ralphie looks like he’s grown a long grey moustache! How much like an old man does he look? I have no idea why he looks like he’s wearing a comedy moustache but I didn’t half spend a good five minutes chuckling at this picture! I absolutely hate storing jewelery, it's so difficult :( Currently, I have a simple, pretty box I keep under my dressing table with everything in, but it's all mushed together. My two favourite pieces, I keep in a little jeweled frog on my bedside table. Oo, I like it a lot! Not too bad for £9.99. Is it very heavy? i'm loving the ring/earrings drawer! I've been looking for some jewellery storage and I've just absolutely fallen in love with these drawers! I think I need to purchase a couple. We don't have a £ stretchers around here though, Boo! Aww, Ralphie is such a cutie. 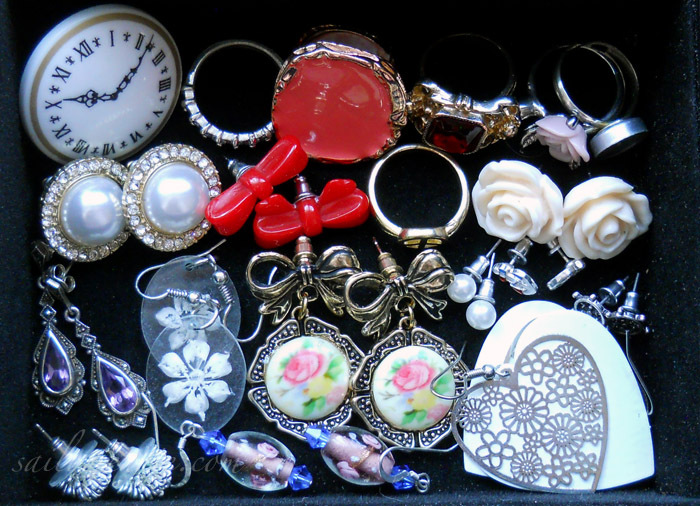 I have a similar jewellery box, but mine is a cluttered mess & far too small for all my stuff! That is SO PRETTY! I love mirrored furniture and storage but like you I avoid it because it just wouldn't stay looking immaculate. 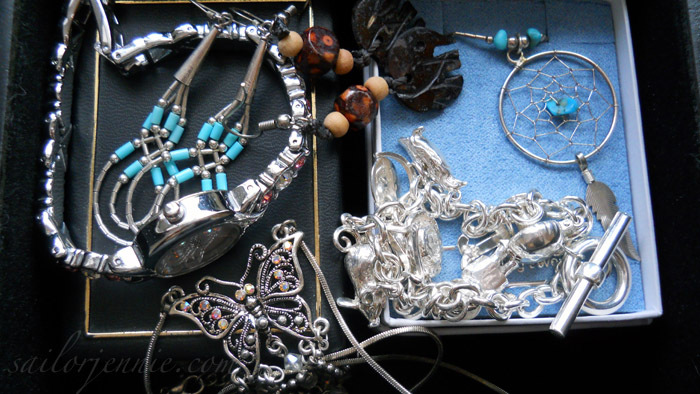 you've got such a lovely collection of jewellery jennie :) might have to pop to pound stretcher myself! I have that exact set of drawers! I love mirrored furniture too! I actually bought a mirrored bedside table and a chest yesterday! Love them! Love your little jewellery chest! 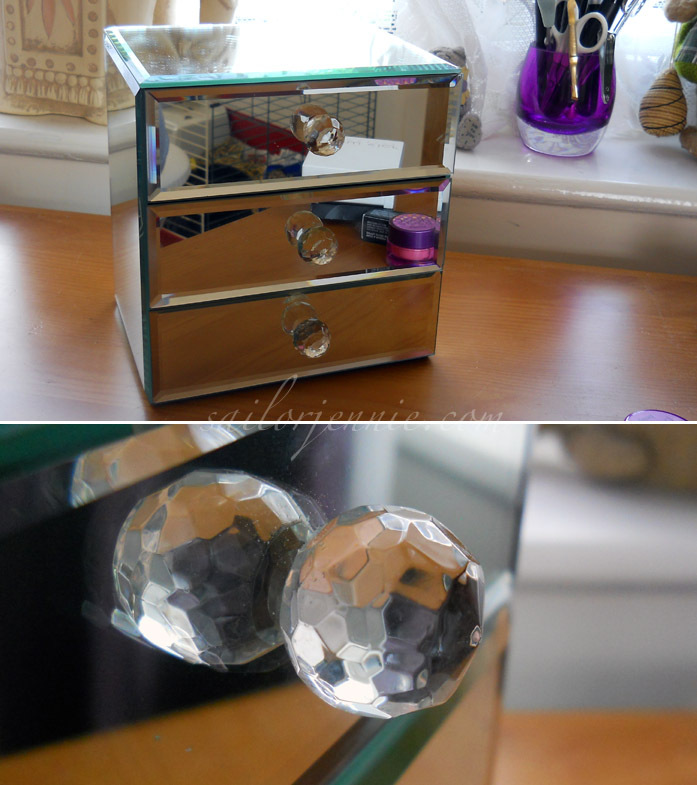 I'd love some mirrored furniture but it would get soo grubby :/ Haha the last picture is so cute with the old man tache! This is super funky and fun. I love it! I keep seeing mirrored furniture but know I could never keep it looking perfect! My jewellery is currently stored on a few mug tree things, but keeps getting so tangled! Ooo that looks so nice! I am a total crazy person when it comes to jewellery storage, and am obsessed with getting all this QVC stuff!